Posted 17.09.2016 at 02:09 in blog by admin / Comments Off on Why Our Teeth Get Discolored And Stained? Albuquerque New Mexico 24 hours emergency specialist cosmetic & restorative dentist Dr William C Gardner at NM Family and Cosmetic Dentistry PC will guide you thoroughly regarding the various causes of the development of yellow, stained and discolored teeth and how to prevent their occurrence with modifying the causative factors in your daily life. Teeth frequently get discolored and stained through two possible mechanisms. The outermost visible enamel layer of your teeth can harbor colored particles and substances from daily intake of dietary products and drinks and get stained. Some staining agents can penetrate the enamel layer and incorporate within the underneath dentine portions which is already yellow in color during tooth development as well as after eruption of teeth within the mouth. Tooth discolorations which only stain the outer enamel layer superficially and can be removed with simple tooth cleaning methods are termed as external or extrinsic stains while those stains which incorporate within the enamel or dentine structure and cannot be removed without complex teeth bleaching and restorative procedures are known as internal or intrinsic stains. Dental plaque layer which forms on the visible tooth surfaces due to proteins present in your saliva, food debris and microorganisms can be easily removed through brushing your teeth within a day or two of its formation. Once this plaque layer mineralizes due to calcium ion deposition, it becomes hard tartar and requires professional scaling and polishing procedures for removal. Us of certain drugs and medications for treating infection in your children or in expectant mothers during the period of child growth can cause discolored teeth. Tetracycline antibiotics, antihypertensive drugs, antihistamines and antipsychotics can stain teeth. You need to avoid this during pregnancy and in children below 8 years of age. Tooth and gum discolorations often present following dental restorative procedures. Dental amalgam fillings can cause silvery tattooing of your gums. 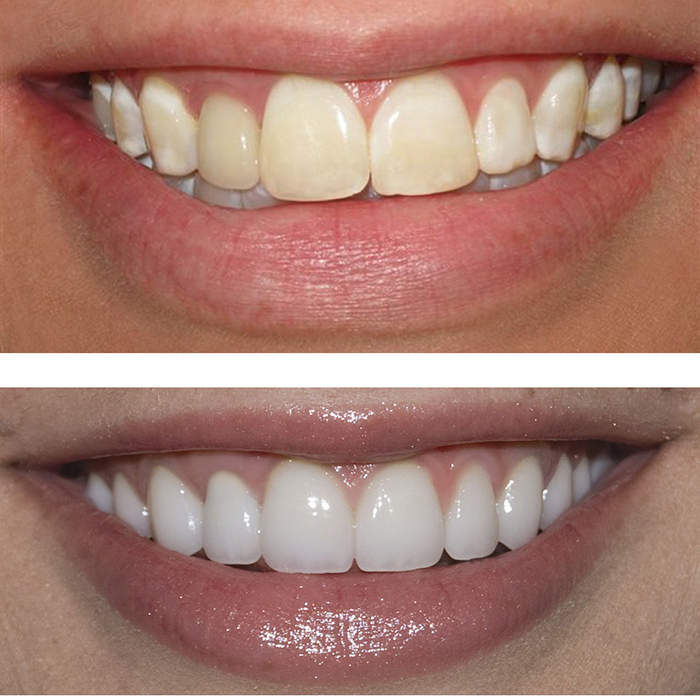 Heavy restorations can produce an underneath hue which can ruin your smile. Graying or blackening of front teeth may be the consequence of root canal treatment. Dr William will guide and perform necessary measures for the prevention of these problems in your teeth. Developmental abnormalities and genetics play an important part in tooth discolorations. Developmental anomalies such as Amelogenesis Imperfecta and Dentinogenesis Imperfecta cause weakening, wear and chipping away of tooth layers causing cosmetic abnormalities. Your teeth will discolor owing to majority of these factors and the condition worsens when certain factors combine together. Extrinsic stains are easy to treat through simple professional cleanings and polishing procedures. Internal stains, on the other hand, need advanced treatment modalities such as bleaching, micro-abrasions, macro-abrasions. It is also about dental laminations, dental crowns and fillings to mask the unsightly appearance of your teeth during smiles.